The AH-1W Super Cobra comprises the backbone of the United States Marine Corps's attack helicopter fleet. Its latest variant, the NTS (Night Targeting System) Super Cobra has received a suite of sensor, targeting and defensive system upgrades. This important new system detects and laser designates tactical targets under daytime, nighttime or adverse conditions. The Super Cobra can carry both TOW and Hellfire anti-armor missiles. The Raytheon BGM-71 TOW missile has a range of more than 3km and semi-automatic line- of-sight guidance. The AGM-114 Hellfire missile is equipped with a semi-active laser seeker and has a range of 7km. 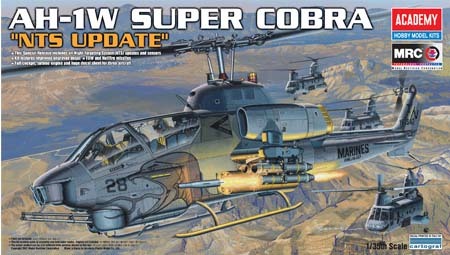 The Super Cobra has fire-and-forget capability when firing the Hellfire missile in co-operative mode with laser target illumination. Because the NTS nose mounted equipment is larger, a reworked nose and canopy shape was necessary making identification easy. Also known as the "Whisky" Cobra, the AH-1W was the first attack helicopter to qualify both the Sidewinder air-to-air missile and the Sidearm anti-radiation missile. Both missiles can use the same LAU-7 rail launcher. Sidearm has a range of more than 15km. AIM-9L Sidewinder is an all-aspect short range air-to-air missile produced by Lockheed Martin and Raytheon having a range of 15km. It can also fire a range of air-to ground rockets, for example 70mm rockets armed with submunition warheads or the larger 12.7cm Zuni rocket bombs. The "Whisky" carries a three-barrel 20mm Gatling gun for close range (up to 2km) engagement and 750 rounds of ammunition. With the gun in a fixed forward position, the pilot can aim by maneuvering the helicopter. Either crew member can slave the turret to the helmet-mounted sight, and aim the gun by looking at the target.